Distinctive case shape designs have been a core part of Cartier’s watchmaking history, with some very recognisable forms that have become mainstays in their collections (and dare we say to the extent that they probably can’t stop them because of public demand), and ones that have waxed and waned with changing tastes. 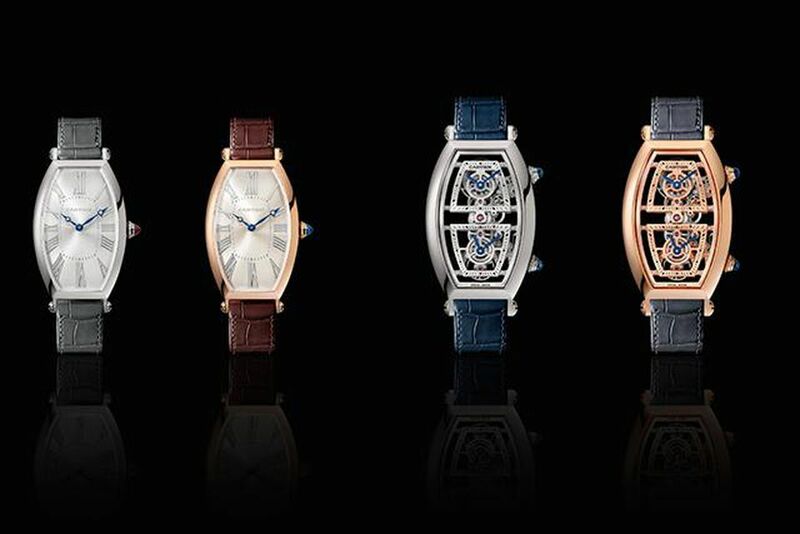 At the SIHH 2019 Cartier will launch the new Cartier Privé, its update of the Collection Privée Cartier Paris (CPCP), a line of mechanical watches that were produced for a decade from 1998. The CPCP line included models in tonneau cases that were first used by Cartier in 1906. These same early tonneaus form the basis of the 2019 Cartier Privé launch models in the form of time-only pieces and the Tonneau Skeleton Dual Time Zone. The original from which these are descended was in platinum and featured ‘vis armurier’ (‘gunsmith’ style) tube screws to fasten the lugs. The new Privé case is double bracketed, with an oblong, curved shape that follows the wearer’s wrist contours. First up, the two time-only models. Cartier is making one hundred pieces each in red gold and platinum. The bezel is formed from one block of the respective metal. With raised Roman numerals, blued steel Breguet-style hands and a railway track chapter ring in common, the radial brushed dial is champagne-coloured for the rose gold version and silvered for the platinum model. Both sport the Cartier cabochon (in red or blue) on the crown for some colour. The screws on the lugs are a nod to the ‘vis amurier’ tube screws. Inside is Cartier’s new manual-wind (a nice vintage nod) Calibre 1917, with a thirty-eight hour power reserve. The platinum watch is limited to 100 pieces. Both come on alligator straps; gray for the platinum, and brown for the rose gold. The estimated RRP is 18,000 EUR for the pink gold, and 21,000 EUR for the platinum. The more horologically interesting pieces in the launch Privé collection are the Skeleton Dual Time Zone models, which also come in rose gold and platinum versions. An update of Cartier’s Tonneau XL dual time, but now skeletonised and with a distinctly more modern feel, it has two separate mechanisms for the home time and second time zone features in the single movement – Cartier’s manual-wind Calibre 9919 MC (as opposed to the dual movement of earlier times). This movement has one barrel, a vertically aligned gear train and regulator, flowing with the lines of the case and linking the two angular independent time displays. Power reserve is sixty hours. The crown at two o’clock is for winding and setting, and the one at four o’clock is a pusher that advances the second time zone in one hour increments. The Tonneau Skeleton Dual Time platinum and 18k pink gold timepieces are limited to one hundred numbered pieces in each metal, with a further twenty numbered pieces in baguette-cut diamond-set platinum. The pricing should be approx EUR 63,000 for the platinum model and EUR 55,000 for the red gold (excluding taxes).